For ages 4-8. Here is a wealth of information and facts in an easy-to-use and friendly format. There are no long paragraphs for kids to wade through. Instead, scientific information is presented in short blocks attractively arranged on the pages with colour photos of animals. Here are basic facts on each animal, such as height, weight, location, and habitat. Here also are fun facts. From cover to cover, this book is full of facts, packed with photos, but absolutely fun to read and look at. Kids of all ages will use this big book for school reports and for browsing. Parents who want to help their child in science will love this book as much as the kids. And the San Diego Zoo logo gives authority to the text. 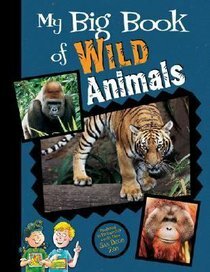 About "My Big Book of Wild Animals"